Intracranial pressure was monitored in the epidural space of conscious, unrestrained rabbits for periods of up to six weeks. 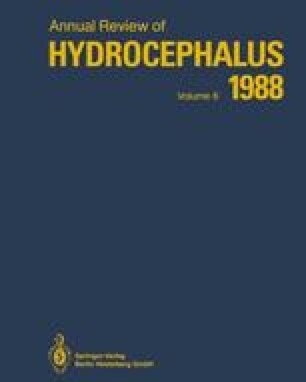 Hydrocephalus was induced by injecting silicone oil into the cisterna magna. Following the injection intracranial pressure (mm Hg, x̄±SEM) rose from 4.4±0.8 to 7.7±1.7 and remained significantly elevated for a period of 2 days. Although the mean pressure returned to control values the variability of the pressure and the amplitude of the transient elevations remained increased. The intracranial pressure wave characteristics of this model of experimental hydrocephalus resemble those in humans with chronic communicating hydrocephalus.